These days 1974 has little if any significance in the minds of comic collectors in the UK, but at the time it was a year of horror and despair. 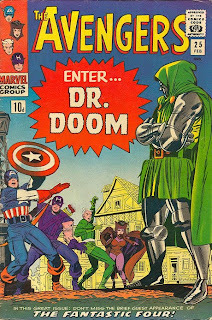 To my 10 year-old self, and other comic fans like me, it was nothing short of the apocalypse as far as Marvel comics were concerned. Because it was the year when, for four to five months at least, American Marvel comics disappeared from the UK altogether, and for a time we didn't know whether we'd ever see them again at all. And it was a period of upheaval in US comic distribution that inadvertently led to the rise of comic shops and mail order dealers as the alternative way of buying comics that we’re used to today. Growing up as a Marvel fan in the early Seventies was a curious and often frustrating affair. Although 'fandom' existed, it was still in its infancy, and pre-internet it grew out of a fanzine scene that itself was inspired by the similar SF community. There was then a common synthesis between SF fans and comic fans – the very first comic shops in the UK (which in 1974 you could probably count on the fingers of one hand) began life as specialist SF stores. Initiation into this cliquey world came through accidentally finding classified ads in the pages of Exchange & Mart where comic dealers and fanzine editors would advertise their services in the 'Books & Magazine' section. Comics themselves were distributed through newsagents and displayed on spinner racks. By and large nearly all Marvel and DC titles were distributed in an ad-hoc fashion throughout the Sixties, up until April 1974, but it was a piecemeal process whereby unsold stock - or 'returns' as they were known then - were shipped over, often as ballast, on slow moving container ships. Although Marvel did print up some stock specifically for overseas markets (often with UK prices) we also essentially got America's leftovers, three to four months after they had been on sale in the US. From 1959 Thorpe & Porter were responsible for distributing Marvel comics to the UK (many old Sixties and early Seventies titles bear an often smudged T&P price stamp on the cover, sadly devaluing the issues in question in the eyes of our US comic-collecting cousins). Thorpe & Porter were eventually purchased by DC Comics in 1964, meaning Marvel were effectively being distributed by their closest rivals in the UK. Publishing in those days worked on a sale or return basis, with comics being massively overprinted. They would be shipped out to dime stores in the US in bulk and at the end of the month unsold copies would be sent back. Laws relating to publishing in the US meant that comic books had to print details of their circulation once a year in the titles themselves, and thanks to that we have an insight into the level of 'waste' that occurred back then. 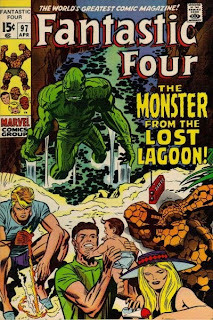 Take Fantastic Four #97 for example (cover dated April 1970). The average monthly number of copies printed was 546,820. The average monthly sales figure however was 338,421 copies. That means 208,399 copies were destined for pulping at the end of the month (imagine what the back issue market would be like now if they had survived!). Some of these would be shipped to the UK (and other countries) in the hope of recouping some sales, but there was no system whereby the UK was promised a certain title at a certain time. It was quite conceivable that in August 1970 that you'd see #97 of FF on sale in the UK, followed the following month by #95, rather than #98. That's the way it worked back then. In an attempt to keep the US comics on the shelves as long as possible, Marvel, DC and pretty much every publisher, cheated by cover dating the comics ahead of the month they went on sale. The idea was that if, in May, newsstand vendors would remove magazines and comics cover dated April, then you'd cover date your comic May rather than April. As your rivals got wise to this and did the same, you then cover dated your comic two months ahead, rather than one month ahead. Before long, comics that would come out in July in the US would be cover dated October, and so on. Coming soon: Pt 2: Face Front, True Believers! Exciting News for all UK Marvel fans! 1974 will always have a special significance for me, being that was my birth year, but fortunately I was too young to notice any lack of comics! good stuff Rob, as someone who fgrew up in Cornwall I appreciate the sporadic nature of UK comics distribution, and that only know am I finishing off half of my collection that started 20 years ago!